Click here to view enlarged graphic. 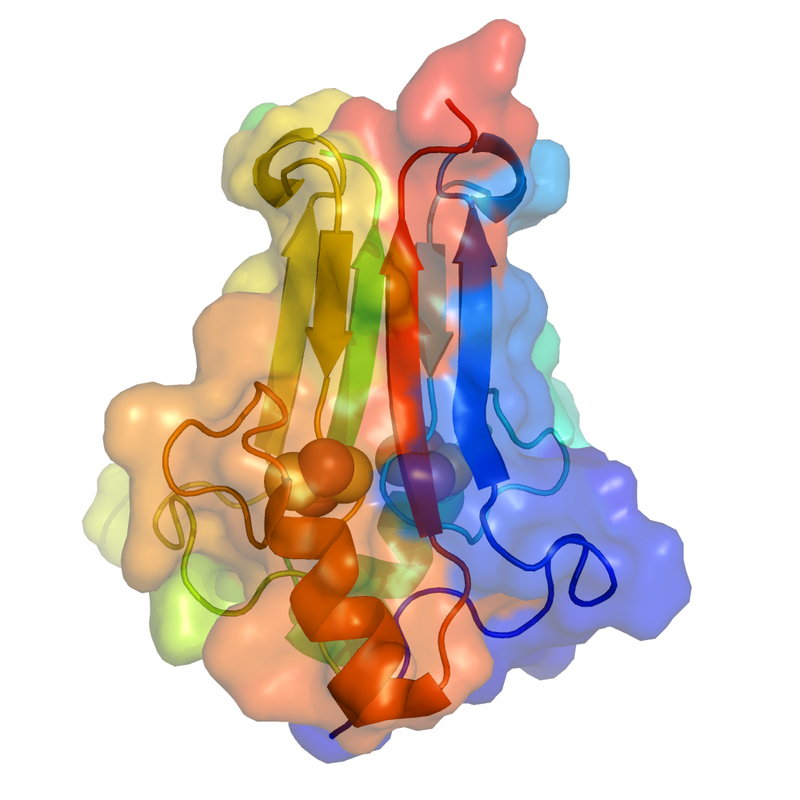 A multidisciplinary team led by researchers at the University of California, San Diego has determined the structure of a protein found in cells that shows potential as a target for the development of new drugs to treat diabetes. The study, published September 4 in the journal Proceedings of the National Academy of Sciences, described the structure of a protein—MitoNEET—that was previously identified as a site where diabetes drugs could operate. The discovery of the protein’s three-dimensional structure makes it possible to design small molecules that interact with it and modify its function. The researchers say that MitoNEET has a novel three-dimensional structure that makes it a particularly interesting candidate for the design of innovative compounds that can bind to it. “Our work may provide a basis for the design of newer diabetes drugs that have potentially greater specificity and fewer side effects than existing ones,” added Paddock. 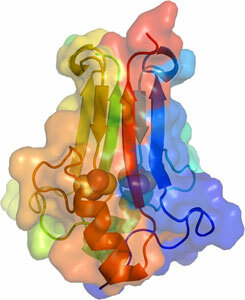 Following the initial work of co-authors Sandra Wiley, Anne Murphy and Jack Dixon at UCSD’s School of Medicine, and in collaboration with Herbert Axelrod and Aina Cohen at the Stanford Synchrotron Radiation Laboratory and Rachel Nechushtai at the Hebrew University of Jerusalem, also co-authors on the paper, the team determined that mitoNEET is an iron-sulfur protein. Iron-sulfur proteins have a variety of functions, including electron transfer, which is critical to cell metabolism, and the storage and transport of iron. In its free state, iron is highly toxic to cells and can lead to oxidative stress—the accumulation of reactive compounds that can damage the cell. MitoNEET’s iron-sulfur cluster is loosely bound, a property that may be linked to one of its functions. When mitoNEET binds the type 2 diabetes drug Actos®, the iron-sulfur cluster becomes more stable. This drug was thought to work through an entirely different mechanism involving a different protein. However, the finding by Jerry Colca, presently at Metabolic Solutions Development Company in Kalamazoo, Michigan, that the thiazolidinediones—the class of diabetes drugs of which Actos® is a member—bind to mitoNEET indicated a possible mechanism involving mitoNEET. Colca’s finding inspired the UCSD-led study, which suggests that Actos® and similar drugs may protect cells from the damaging effects of free iron by keeping the iron-sulfur cluster attached to mitoNEET. From mitoNEET’s structure, location and properties, it could also play a role as a sensor of oxidative stress in the cell. Oxidative stress is a problem in many diseases including diabetes. MitoNEET is confined to the mitochondria—structures within cells that convert nutrients into energy—where reactive compounds accumulate as nutrients are metabolized. MitoNEET’s structure would allow it to transfer electrons to and from, and therefore detect, these compounds. “MitoNEET may be an example of an ever increasing group of proteins found to have more than one function. I think we are at the beginning of what is sure to be an interesting and biologically important puzzle.” said Paddock. The team plans to use the new structural information for designing more sophisticated experiments to test function and structure-based drug design to create drugs that interact better with mitoNEET. Collaborative experiments are currently underway with Colca’s group at Metabolic Solutions Development Company. Other UCSD co-authors of the paper were Edward Abresch in Physics and Melinda Roy and Dominique Capraro in Chemistry and Biochemistry. The study was supported by the National Institutes of Health, the Department of Energy and the Zevi Hermann Shapira Foundation.